NEW YORK, March 22, 2019 /PRNewswire/ -- OUTFRONT Media Inc. (NYSE: OUT) today unveiled a campaign designed by its in-house creative studio OUTFRONT Studios in collaboration with Comic-Con. For eight weeks leading up to Comic-Con's WonderCon 2019 in Anaheim, California, local residents and tourists can witness their favorite heroes soaring in the sky. 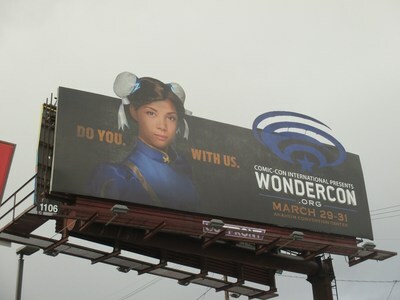 With a mission to amplify awareness of Comic-Con's Los Angeles area-based sister show WonderCon that embraces all aspects of comics, movies, TV, animation, and more, Comic-Con tasked OUTFRONT Studios with creating a campaign that would entice people to take notice. The cinematic and heartfelt creative features fans of all backgrounds and ages honoring their favorite fictional heroes and villains along with the tagline, "Do you. With us.," to highlight WonderCon's long history of being a fan-centric show that highlights all aspects of comics and related popular art. "From our first meeting, it was clear the OUTFRONT team not only understood our mission but also the special relationship we have with the tens of thousands of fans that visit WonderCon each year," said David Glanzer, Chief Communications and Strategy Officer for Comic-Con and WonderCon. OUTFRONT Studios delivered a campaign that was both creative and inclusive and one that we're very happy to feature in our promotions for WonderCon Anaheim 2019." In addition to displaying the campaign across OUTFRONT Media's digital and static out-of-home assets around Los Angeles and Orange County, the campaign was also adapted to run online and in-print. "Our team was ecstatic to work with Comic-Con to make a statement with engaging, eye-catching creative and inspire those who come across the ads to become their favorite characters at WonderCon," said Mike Moss, LA Senior Art Director at OUTFRONT Studios. "From start to finish, Comic-Con was a true partner that supported our ideas and ambition with open minds and honest feedback. We look forward to working with Comic-Con on more larger-than-life and entertaining campaigns in the future."